Apple has, as expected, lavished some upgrade love on several of its products: The Mac Pro, the iMac and the Cinema Display lineups have all been tweaked to improve their specs. The Mac Pro even got a 12-processor core option. Apple’s all-in-one iMac stays pretty much the same from an exterior point of view, with Apple even tagging it as “beautiful on the surface, more powerful below it.” That extra power comes from Apple’s switch to supporting Core i5 and Core i7 chips from Intel, a new architecture for Apple–and the result is the “fastest, most powerful iMac yet.” This comes partly from the quad-core architecture on the CPUs, for which OS X Snow Leopard is already primed to maximize thanks to the task-sharing powers of the Grand Central code, and partly from a switch to new graphics cards. The base option for graphics is now an ATI Radeon HD 4670 discrete card, which Apple is careful to note “delivers faster performance compared to the integrated NVIDIA GeForce 9400M Processor in the previous-generation iMac.” There’s also the option to add HD 5670 or HD 5750 units in instead, bringing some serious graphics power to the iMac. What can you use this graphics power for? Apple goes out of its way to mention gaming on the new iMac Apple web page, giving a call-out to Call of Duty 4 and EVE. The company evidently hopes its popular iMac can now, with some serious boosts to silicon power (dual-core speeds up to 3.6GHz and quad-core up to 2.93 GHz), compete in the games PC market–a space Apple’s not been particularly conspicuous in. The prestigious Mac Pro is now even more prestigious: Apple’s calling it “the fastest Mac ever.” While that epithet could be equally applied to the top-of-the-line Mac from every previous generation, the new Mac Pro probably deserves is as it now includes a dual-6-core Intel Xeon CPU option. That gives the Pro 12 cores of processing power, and as I noted in the rumor post about the news yesterday this is more or less equivalent to low-end supercomputer power of couple of decades or ago–machines that cost millions, and took up entire racks in server rooms. Apple’s suggesting the performance boost can even be measured as 50% greater than the previous generation. There’s also the option to install up to four 512 GB solid-state drives inside, with access speeds which will please the video-processing/editing crowd among whom the Pro is already popular. These folks will also approve of the Radeon HD 5770 and HD 5780 options for graphics–outperforming the previous generation’s graphics power significantly. Apple’s also highlighting the environmentally-friendly side of the Pro, with a dedicated web page that tells consumers the machine is BFR-free, PVC-free, meets Energy Star 5.0 specs, is rated EPEAT Gold, and has a “highly recyclable” aluminum enclosure. 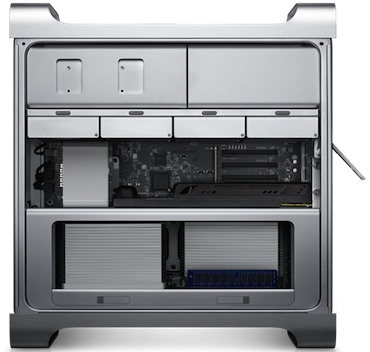 What hasn’t shown up, on the Pro or the iMac, is a USB 3.0 connector, or the faster FireWire 1600 spec that had been rumored. We’re guessing Apple did the math and decided it wasn’t worth including until the next refresh–or possibly that USB 3.0 may be quickly superseded by the competing, but similar, LightPeak technology. 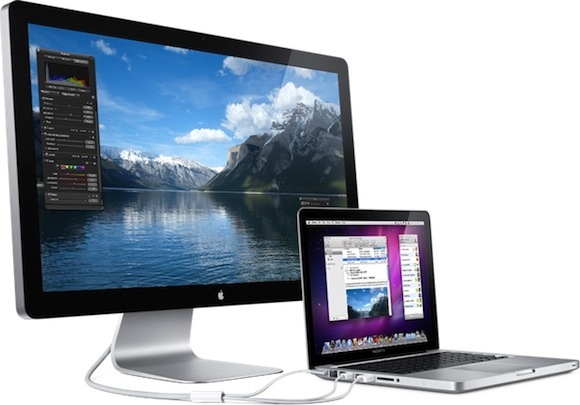 Apple also, true to the rumors, revealed a new Cinema Display unit with a 16:9 ratio 27-inch screen. In fact since the unit also comes with a built-in iSight webcam, you’d be forgiven for thinking it’s just a repurposed 27-inch iMac with some of its guts removed. It’s got 2560 by 1440 pixels (60% more than the old 24-inch unit), LED backlighting, and the same sort of high-end IPS LCD technology that the company’s been touting for the iPad. The unit also comes with a 49-watt stereo speaker array, complete with subwoofer, and even powers-up connected MacBooks with a dedicated MagSafer power cord. Apple also promotes its eco-credentials by noting that when it’s in power stand-by mode, it eats just 1W of power, which is impressively low given the power-hungriness monitors usually demonstrate. Aesthetically it’s a slight departure from the older Cinema Display look, and Apple’s “displays” page now only carries info on this new unit–so we can speculate that Apple’s killing both the 24-inch and 30-inch units it used to sell in favor of this new design (and achieving economies of scale in its production line to boot). The company’s stuck a big, bold “Coming Soon” logo across this new Web page though, and the older displays are still on sale in the Apple Store, so we’ll have to wait to find out. Update: … Or perhaps we won’t. Official word has leaked out that when the 27-inch display hits the shelves for $999, Apple will be ditching both the 24-inch and 30-inch legacy Cinema Display units.